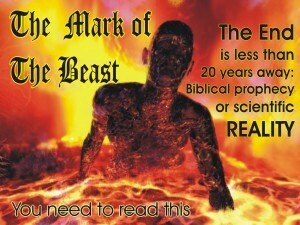 Different interpretations of this ‘revelation’ abound, from: the literal (and somewhat childish) belief that the number 666 will appear on our heads or our hands during the ‘End of Days’; to the belief that bar codes are the Beast’s numbers or mark; to a less literal belief that it is the head (thought) and the hand (actions) that will determine whether we are destroyed or not. It seems odd that the sternest warning, supposedly given by God, in the whole of the Bible, isn’t very clear. You’d think that when it came to a choice between short-term comfort, then eternal pain, or short-term discomfort and then eternal happiness, God would have given us a clearer idea of what we were choosing. Perhaps the obscurity was intentional because, if it had been made ‘black and white’, bad people would choose good for the wrong reason. In other words, maybe God wanted to weed out the truly good souls from the bad. Only those who are guided by unselfish faith in what’s right, and live by those principles, are welcome in Paradise. Those who are guided by greed and selfishness can go to Hell! Back to reality: Most of us don’t believe in Biblical prophecies and yet, in a way, this one IS ALREADY HAPPENING. A minority who believe in what’s morally right are made fun of, have to pay more for commodities and, worst of all, carry an enormous burden of sadness and pain because of their compassion for others who suffer for the ‘needs’ of selfish people. The difference is: the good guys are probably all going to die with the rest of the World. Nearly every scientist, in every nation, agrees that animal agriculture is singularly the most destructive force to our environment, and, unless it stops soon, we have less than twenty years until the complete collapse of our ecosystem – and the subsequent death of humanity and many other species (or a ‘Hell on Earth’ for the survivors). So, it seems evident that everyone who supports animal agriculture by buying the flesh, the bodily secretions and other body parts (like leather) of innocent, over-bred ‘beasts’, is actually causing ‘The End of Days’. They carry the ‘Mark of the Beast’, not only on the heads (thought) and their hands (actions), but in every cell of their bodies! What’s also intriguing is the fact that most religions originally taught that to harm animals, for any reason, was forbidden. True Buddhists are vegetarian. Jesus and his followers (according to very strong archaeological and historical evidence) were most likely ethical vegetarians (but Rome stomped out that part of the Christian belief, probably because it upset their economy). Mohammed, too, taught kindness to all creatures and, apparently, was particularly fond of cats. These were not crazy whackos or extremists. They were highly intelligent and well respected people. And there have been many more like them: Socrates, Voltaire, Ben Franklin, Bernard Shaw, Edison, Einstein, Gandhi, just to name a few. It’s now common knowledge that eating meat and dairy causes most of the serious health problems in western society, and that a vegan diet slows down the aging process, promotes vitality, eliminates the need for pharmaceuticals and lengthens life by up to twenty five years. It’s not so widely publicised that there is enough food growing in the World, right now, to feed the Earth’s human population twice over! Yet most of that food (including more than half of the seafood) will be used to fatten massively over populated numbers of ‘beasts’ destined for our dinner plates. The saddest fact of all is that 100 billion land and sea animals, with almost exactly the same ability to feel pain and terror as humans, are tortured to death every year to provide unnecessary food. Female cattle will be mechanically raped over and over again to keep them pregnant. Their terrified babies are torn from the grieving mothers before they taste their milk, which is then transported to us for our cornflakes and coffee. We’re the only species that steals the baby food of another species. By choosing to use products of animals who suffer, have you chosen ‘The Mark of the Beast’? When you look at these facts, without the prejudice of tradition or corporate brainwashing, you will realize that to choose meat, dairy and eggs is to choose evil and The End of us all. Save your children, save the World, save the animals and maybe.. save your soul. Become what humans were *designed to be – Vegan. *(Despite unscientific arguments to the contrary, human metabolism is designed for plant matter. That’s why we have to burn or mince meat to make it chewable or digestible. In our long digestive tract, raw meat would putrefy and poison us. We have mainly flat teeth for grinding grains and vegetables, except for four ‘canines’ and incisors, designed for tearing fruit not raw flesh. Humans were not natural carnivores or even omnivores but climate change forced our ancestors to eat corpses and learn (perhaps from dogs) how to hunt. Only, 10,000 years ago they learnt how to imprison and enslave wild animals. The very first war was probably started by one tribe stealing another tribe’s animals.